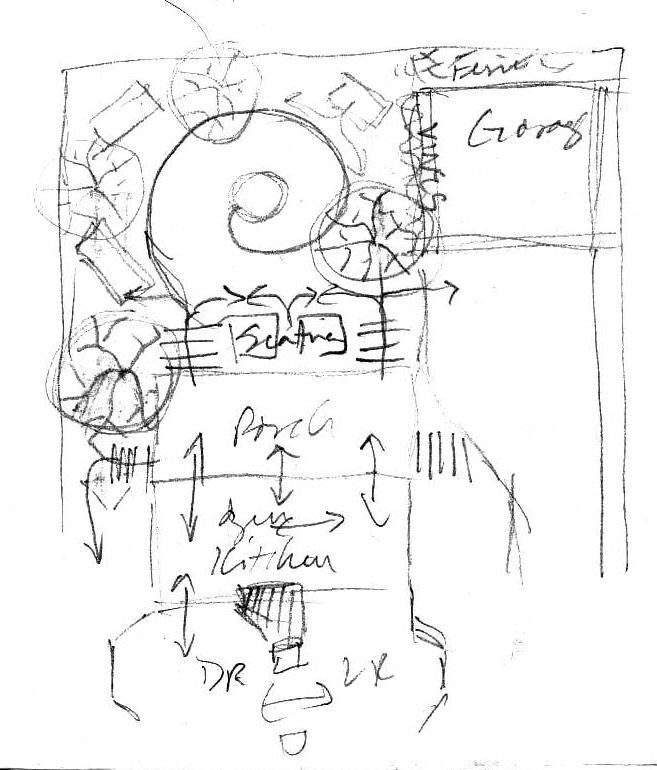 Sketch from notebook showing proposed design for backyard garden with renovation of the back of the house. The back of the house faces East. South is to the right, and North to the left, in this sketch. 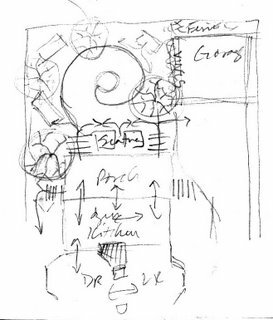 Changes to the house envisioned in this sketch include restoring the pocket doors between the dining room and living room, converting the two back bedrooms and half the current kitchen to a porch opening onto the back, and re-orienting and expanding the kitchen along the porch. My good deed for the day: Letting a fat man on the subway know his fly is open. I can relate. I've done the same in the past week. It's not easy for a fat man to be aware of his appearance below the chest. Easier, more comfortable, to stay in the head. There I can be as thin as I remember I was. John and I bought a house. I've written nothing for so long. Major events like that can just slip by without notice. It's a big house. So far, it's too big for the two of us. And it needs lots of work. I'm trying to do a little each day, but it's hard. Got off the R at Rector Street. Now sitting on a bench in the graveyard of Trinity Church. "Here lies ..." "Sacred to the memory of ..." Even the bench is worn, low to the ground. To remind us, I guess. I like to walk through here on the way to work. From our new home, my commute offers more opportunities to do so. Reminders of impermanence to help me keep work in perspective. The gardens here - the cemetery is a garden - are simple and beautiful. Massive hostas, irises, past bloom. Daylilies, clouds of them, in fat green buds, just about to announce summer. I'm starting my fourth garden in New York City. Some day it will be on the Victorian Flatbush House & Garden Tour, probably years before the house itself is. I can aim for 2008, the year of my 50th, three years away. There are at least four gardens to be developed: two sides, the front, and back. All have something different to offer. Each can welcome visitors in its own way. All will relate to the house, and relate the house to the grounds. It's already happening, as I come to understand the house and what it wants.